As a child, Bethlehem-born, Christian Palestinian Sami Awad watched as his uncle was arrested and then deported from Israel for participating in nonviolent resistance to the occupation during the First Intifada (uprising). Sami’s father, Bishara Awad, had become a refugee at the age of nine when his father was killed, and the family was forced out of their home in West Jerusalem in 1948. Sami grew up knowing these stories, past and present, experiencing historic pain as well as his own oppression. He began to examine the power of nonviolence but wondered whether he could truly love his enemies as his faith, and Jesus, commands in the Bible. He attended the University of Kansas earning an undergraduate degree in Political Science and then earned a Master’s degree in International Relations from the American University in Washington, D.C. In the early 1990’s, Sami saw the Oslo Accords as a process of segregating communities in the Holy Land, rather than building relationships between peoples. Leaders on both sides were failing, and life for their people was not improving. Influenced heavily by the work of Gandhi as well as the Sermon on the Mount, and the legacy of a family committed to peace and nonviolence, Sami founded Holy Land Trust (HLT). Since 1998, HLT has focused on nonviolence as the catalyst to end all forms of conflict and establish an enduring, and comprehensive peace. HLT seeks to strengthen and empower the peoples of the Holy Land to engage in spiritual, pragmatic, and strategic paths that will end all forms of oppression. Through the years, their work has remained rooted in empowering individuals to seek solutions through social justice, compassion, and love. In twenty years of operation, HLT remains committed to the same principles though they have developed numerous new projects. HLT established The Peace Research and Learning Center (PRLC) with the goal of engaging in conflict research and analysis to create the means and strategies for transformation and resolution. Their focus is not solely on a political level, but also on the social, economic, and environmental spheres. The PRLC has a ride range of resources to support the local and international community which has allowed them to conduct pilot research studies on nonviolence and trauma with a focus on memory and narratives, restorative justice and transformative justice. HLT also hosts tours based around the olive harvest season, an annual arts festival in Bethlehem, and the Tawasulna Youth Program, a preventative project which deals with Palestinian youth who have been affected by the conflict. Their programs continue to expand as their relationships build. Sami has hope for the incredible transformation of the Holy Land. While he acknowledges the hardship of life under occupation and those affected by violence on both sides, he envisions a future where the people are committed to peace and mutual respect. Transcending political solutions, Sami says the people can and must create this reality together, encompassing their shared identity and welcoming the beauty of their differences. Even the concept of nonviolence is not enough. Holding tightly to steadfast hope, the Holy Land will light a torch that spreads throughout the entire region and world. This is his heart, passion, and life’s work at Holy Land Trust. Sami has traveled with Churches for Middle East Peace on several Pilgrimage to Peace (P2P) speaking tours, visiting churches, schools, community groups, and other religious organizations throughout the United States. He will be joining CMEP at our October 2018 P2P. Join us to learn what it means to be someone who pursues peace, while advocating for justice in the Israeli-Palestinian conflict and beyond. Our God, we place our faith in you and your heart for justice. Give us discernment for your ways ahead. We ask for your continued guidance and blessing on Sami and all the peacemakers that work to heal the wounds that divide us. Through your son, Jesus Christ we pray for unification of your land and your people. We pray that you would empower the Christians of the Holy Land to persist in loving their oppressor and renew their hope for reconciliation. Let us all, as one body remain steadfast in our belief in the redemptive work of Christ. Help us as we continually seek ways to support Sami and the staff at Holy Land Trust. Keep us on your path in pursuit of a just peace. Amen. 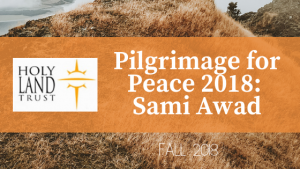 You can meet and learn from Sami in October during Churches for Middle East Peace’s Fall 2018 Pilgrimage to Peace Tour. Learn more. Celia is a volunteer with the CMEP Communication team. After returning from a 2011, dual-narrative trip to the Holy Land, Celia searched for ways to become involved with advocacy. For three years, she led teams from National Community Church to Bethlehem to learn from organizations and local peacemakers that pursue justice and reconciliation. Upon return, she connected team members to CMEP’s advocacy work and approach to holistic policy. CMEP is very thankful for the writers who contribute to our Prayers for Peace blog. However, CMEP does not necessarily agree with all the positions of our writers, and they do not speak on CMEP’s behalf.